Providing security on your site is an essential requirement. We can help you provide a warm, dry place for your site security guard with up to 360° vantage points over your site. Security gatehouses and guard huts are also suitable as toll booths, access control points, kiosks and drivers check-in points. 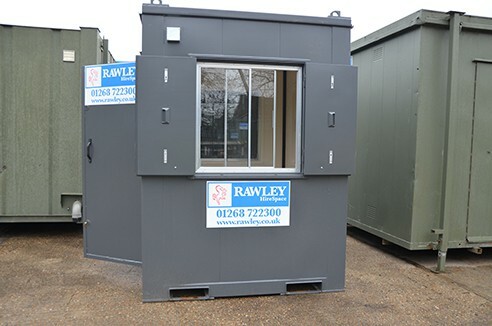 Our steel security guard huts and gatehouses are supplied complete with heating, lighting and power points and only require a mains 240 volt or generator power supply. Furniture can be supplied subject to availability at time of hire. Need Secure Site Fencing? Click Here. Our security site guard huts and gatehouses are delivered using a lorry-mounted “HIAB” crane. For more information about transportation please click here. Yes, as long as the ground is solid enough to take the weight of the delivery vehicle and security gatehouse. Ideally ground should also be as level as possible. The unit also needs to be close to a mains or generator power supply. For more information about access and siting please click here. Yes. A power supply is required to operate the lighting, heating and power points. We offer a breakdown service during normal working hours. If you have a breakdown please contact us and we will arrange for a service engineer to visit your site. See our Breakdown Promise.